In retrospect, it was rather odd, how when I presumed that Rainbow wasn’t cut out to be an agility dog, I focused my energies on learning as much as I could about horses. I knew some, but not as much as I know now. I have no regrets about this turn of events because I enjoyed learning about horses. I still at times feel like I know very little, but feel like I can now spend time working in both venues. following and directing one or more moving objects – sheep, cows, ducks, and chickens included. However, in order for the dog to get the job done, it must have rapport with its handler. And in order for the dog to have rapport with its handler, it must be able to comprehend what the handler wants it to do. And vice versa. Search and rescue: Today I followed and listened to Stacey as she provided support to Cathy and her dog Tara. Tara, a German Shepherd, has had a year’s training as a trail dog. Trail dogs sniff a given object (today this object, a hat, was placed on the ground) and then follow the scent that the owner left behind. She must specifically locate the person and alert the handler to the subject’s whereabouts. The alert is specific to that particular dog. When being trained, the handler touches the subject, and after, the dog is rewarded with a treat, toy, copious praise, and an intense play session, which is prompted by the subject and the handler. Tara and Cathy headed down road, Tara out front, sniffing the path, most likely following the scent. This wasn’t easy, for cars in passing obscured the scent. About a quarter of a mile later, Tara indicated to Cathy that she wanted to turn right. On that particular side of the road was a treehouse. And there was a man sitting on the platform. Tara saw and moved in the direction of this individual. Cathy then redirected Tara back to the road. We continued on the road, to where Stacy (the real subject) was hiding. This was on the left hand side of the road. Tara found her, and was rewarded with food treats. Here’s where anticipation comes in. Had Cathy and Tara been completely attuned to one another (and this will come in time), the dog would have remained on scent and not paid much attention to the fellow in the tree fort. My own thought on the matter was that Tara did as she was being trained to do, but she might not have, had this been a real search. 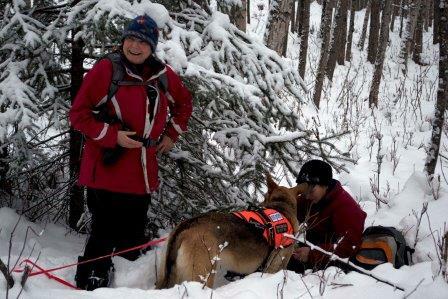 This is all complicated by the fact that there is a three-way interaction going on in search and rescue – interaction is taking place between the dog, the handler, and ultimately the subject. 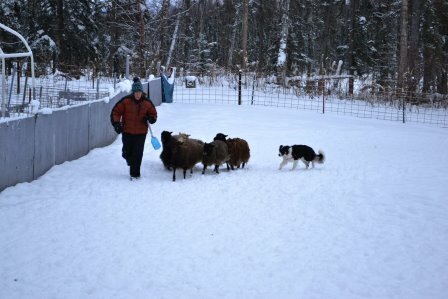 Herding: Pete and Ryder went to work first. There were about a dozen sheep, and we worked in the larger enclosure. Their session went well. Pete repeatedly made eye contact with Ryder, whose own eyes moved back and forth between him and the sheep. At one point, he stopped and the sheep stopped. And Ryder then had to move the sheep to him. It took some time, but she eventually did this. A few minutes later, I tried having Ryder put the sheep in a corner, and then having her move them out of that corner. This turned out to be ridiculously difficult. Ryder jumped into the sheep pile, first to one side and then to the other. Suzann, who was watching, gave me some directives, which essentially amounted to pay close attention to the body language of the sheep and the dog. And Pete gave me another, which was instead of hustling Ryder around, put her on the left side of me, on the fence. Suzann later indirectly concurred with Stacey, that reading dogs can be difficult because they signal their intentions in differing ways. For example, Ryder, being a border collie, uses her eyes and positions her body strategically, while Royal, a welsh corgi, tends to put his whole being into bounding from place-to-place. This is all complicated by the fact that there is a three-way interaction taking place between the handler, the dog, and the sheep. Making this comparison was difficult for me. So I can only imagine what it would be like for a dog to have to do the same. We shall see, because Ryder is also going to get search and rescue training. I have two more sessions before Ryder and I begin working with the other trainers. Our training will begin at the end of February.